Magento, famously, has a twofold reputation. For example, an expert trying to praise the cart would of course mention it’s plethora of built-in features and unlimited customization opportunities - the virtues Magento is most known for. However, if one was to write a derogatory article about the platform he could still talk about the same characteristics, only with a negative bias. Thus, lots of features would turn into a bloated and puzzling admin panel, modular architecture would present a hellish complexity and an abuse of user-friendliness. That said, there are two things, that can’t be associated with Magento ever - mediocrity and lack of improvement. Every new platform’s build brings new revolutionary features to e-Commerce market, giving Magento enthusiasts new things to be obsessed about and reasons to upgrade. 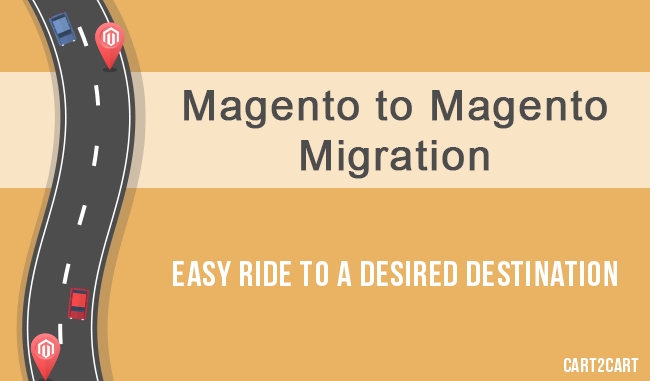 So, if you are, just like Cart2Cart members, a Magento admirer, today we’ll acquaint you with an alternative way of Magento upgrade - a Magento to Magento migration. As opposed to traditional methods this one permits to transfer data from any version of Magento to the newest release, and keep your old shop online during the switch. Thus, let’s get to it. So, if you’d like to perform a Magento to Magento migration right now, be our guest, we’d be privileged to help you. Good luck with your online business.